I have to apologise for being a bit slack lately when it comes to posting. Actually this seems to be a pretty standard opening for most of my posts lately and I'm running out of excuses other that just being plain slack... I still have a lot of meals from our not so recent visit to Bangkok to catch up on and I am determined to get them all completed. It was such an amazing holiday with so many wonderful meals that I have to admit that I don't mind having to revisit the photos as they bring back some great memories. This time I'm writing about Nai Peng which is a chicken noodle shop near Chulalongkorn University in Hualampong. Once again I learned about this place from my trusty Bangkok's Top 50 Food Stalls guidebook. I mention this so aften I should probably add a link to Bangkok Glutton's blog where you can purchase a copy. Even if you're not planing on visiting Bangkok, for around $15 it's worth grabbing a copy as it is a very interesting read and definitely will have you thinking about getting over to Thailand in the near future. It actually made for quite a fun little adventure trying to find some of these stalls. A bit like a treasure hunt really with a real pay off when you actually find the place you're looking for. Some of them are quite a challenge to find as Chow readily admits some of her maps are not quite as good as they could be, clearly her focus is on food rather than maps. Anyway, here's the link if you're interested. Nai Peng was no exception when it comes to being difficult to find. You'd think that having the address to show to the tuk tuk driver would make it nice and simple but due to the subtle tonal differences in the Thai language you can often end of a long way from where you want to be. This was the case on our first attempt to get to Nai Peng which is located in the Suan Luang market but due to my mispronunciation (a common occurrence) we ended up nowhere near where we intended. Apparently there is another market that is very similarly pronounced to Suan Lunag. You can imagine the 'oh you mean Suan Luang, not Suan Lunang' with both sounding identical to my western ears. Our second attempt was much more successful and we arrived just before the lunch service and had the opportunity to see them preparing some of the ingredients for service. 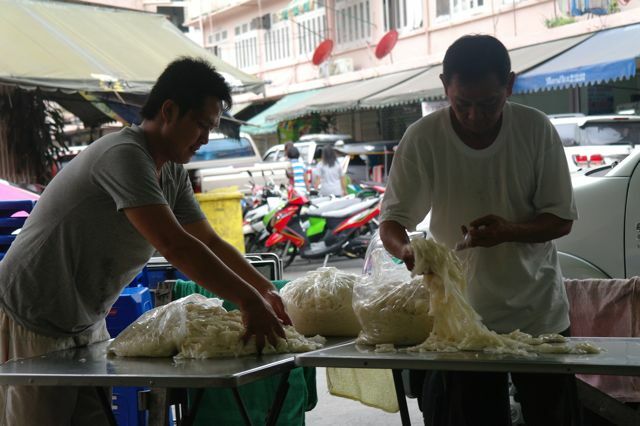 I'm not sure what these guys were doing with the noodles but it seemed to be some kind of separating process. They took all the lovely looking fresh Sen Yai (wide flat rice noodles) out of the bags, smooshed them around the table and then put them back into the same bags. 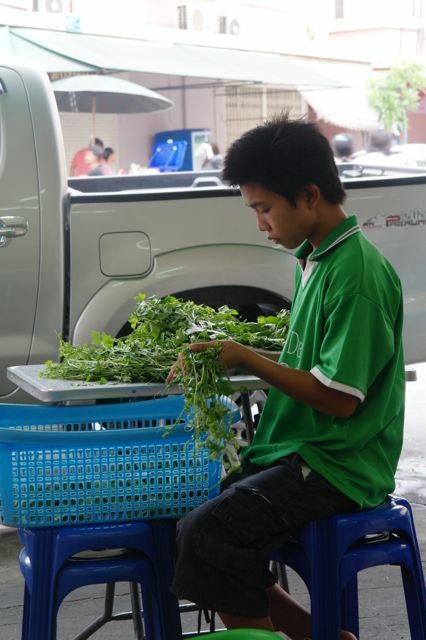 This young fellow had the unenviable job of preparing some kind of herb that I couldn't identify. As with most of the Thai vendors at least he got to sit out on the street where he could enjoy all the happenings rather than being hidden away in the kitchen. This is really one of the less considered benefits of street trading from the vendors perspective. The convenience for the customers is pretty obvious but when you talk to the vendors they really have a great sense of community with their fellow stall owners and the whole process is incredibly sociable as they chat and joke to each other constantly. I'm sure this is a major reason they find the energy to get up so early and man their carts and shops day in day out from the early hours of the morning until sometimes late into the evening. It goes without saying that the noodles were just sublime, beautifully charred with a wok imbued smokiness and a texture unlike anything else. This was a turning point for me and left me wondering why these wide noodles dishes like Pad Eee Eew and Pad Ki Mao are not as popular as the infamous Pad Thai. The little extras are what set the great noodle dishes apart from the god ones and the addition of the little crunchy fried processed squid noodles and lashings of Sriracha sauce took this great dish to that next level. 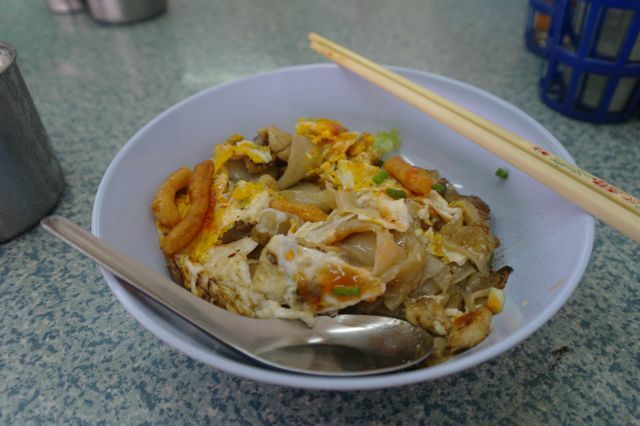 Like most of the noodle dishes in Bangkok the price per bowl of 30 Baht ($1) will have you thinking about consuming a second of possible third bowl.